We had a fun-filled 4th of July weekend! 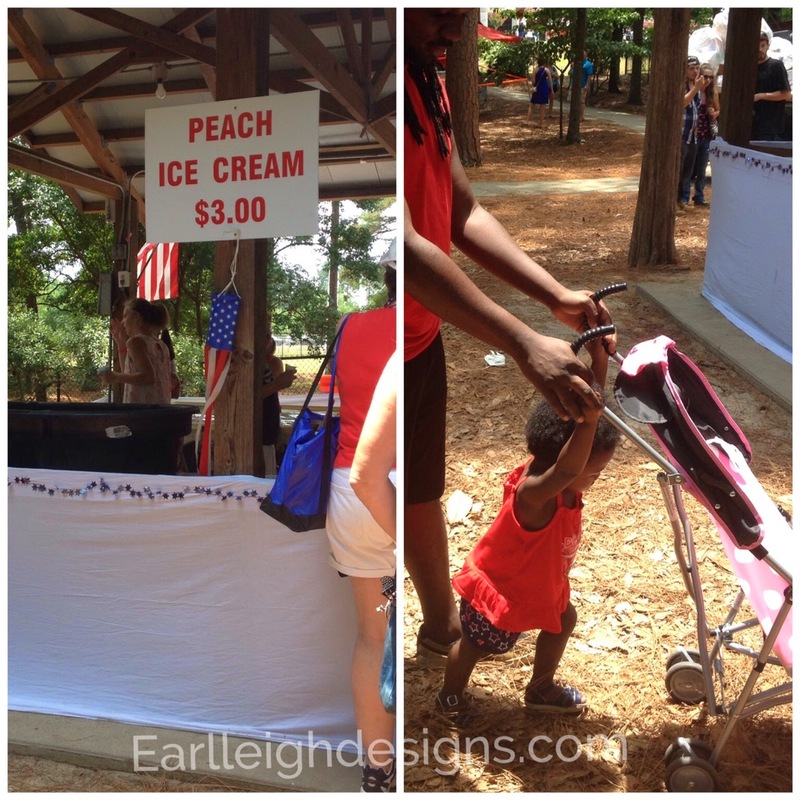 After a couple days of moving furniture out and around, the local July 4th Peach Festival was greatly needed. Mike has lived in Columbia longer than I have so he went to the festival once before and described it as a “drag”. His lack of enthusiam did not deter mine. We packed up a diaper bag, Harper’s cute new umbrella stroller and hit the road. “Diet be damned” is what they should call it next year. 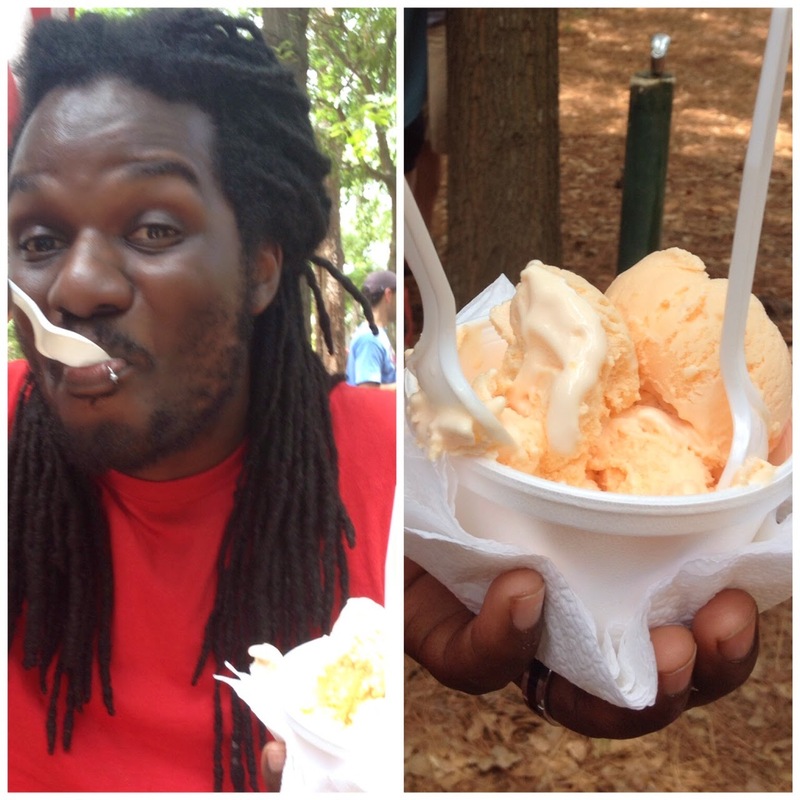 We had peach cobbler, slushies and ice cream. There were many other peachy goodies to test out but we try to be conservative when we can. Ha! Mike wasn’t getting to the ice cream fast enough for Harper. She grabbed onto the stroller and started pushing while screaming “EAT, EAT” at anyone who dared to be in line ahead of us. No ankles were harmed…thankfully. Mikey got the first taste and most definitely approved. There were chunks of peaches. Drool. After the festival, we dropped Harper off with her grandma for the night because it was our friend’s birthday celebration. Her husband rented a huge 13ft slip ‘n slide. I’ve never seen so many grown men regress to age 12 at one time. Because we were out so late at the festival, Mike and I got to their house about 20 minutes before the rental company came to deflate the slide. He made every minute count. While it looked like fun, yours truly did not indulge. My new bikini top did not support that type of activity. Oh well, someone has to play photographer. Was your weekend action packed or chill?! Let’s dish. Sounds like you had a great time to me! Dude! 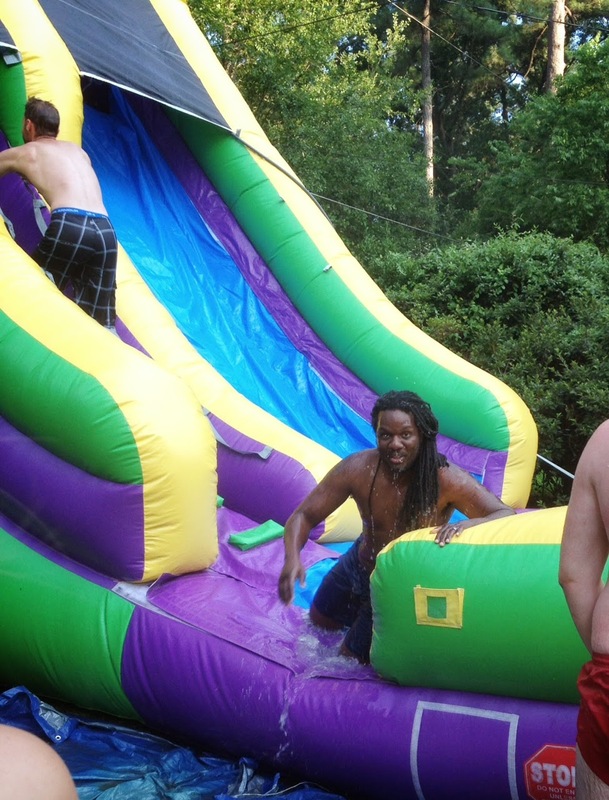 It was a slip and slide for adults! Tops optional bahahahah. You deserved a fun night and you look like you had it! Love the bikini top–you look smashing in it and the colors, print and cut are gorgeous. And I need a giant blow up slide for my house NOW. Peaches. Peaches everywhere. That is heaven. We had a dog named Peach Cobbler. No joke. Blow ups are always fun. My nieces always have them at their birthday parties & I'm pushing kids out of my way to get on it. Good for you for not indulging. I wish I had your will power! I bet Peach Cobbler was the sweetest dog ever! HAHA. Mike would've fainted and I didn't have my smelling salts. It was a great night! Thanks girl!